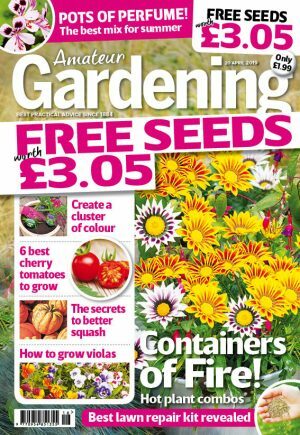 AG’s resident veg expert Charles Dowding has mentioned on several occasions the importance of gradually potting on plants raised from seed. From germination until ready to plant outside, this could mean potting on plants several times, only slightly increasing pot size each time – this should be done when roots are seen poking through the drainage holes below. Well, I seem to have proof of that fact with my young gerbera plants. I sowed all my F1 ‘Revolution Terracotta’ (GroSure) seeds in one batch here in the AG office, and have been growing them on under the artificial lights of my Aero Garden. This year I’ve been using J. Arthur Bowers grow tubes for potting on most of my flower and veg seedlings. When it came to potting up the Gerbera seedlings I actually ran out of the tubes and had to put the last few seedlings into bigger po4in (10cm) pots. 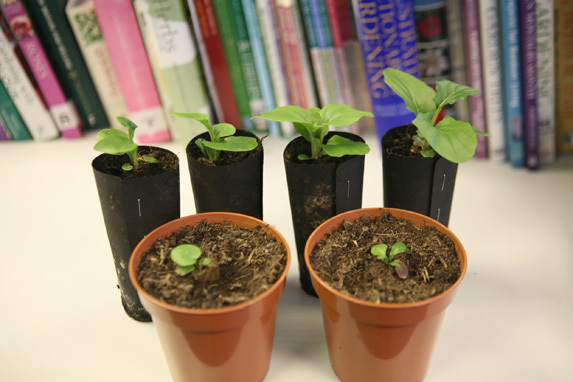 Once potted on, all plants have received the same conditions and treatment. However, as you can see from the photo here, those plants that have had their roots constrained by the narrow grow tubes are performing much better than those placed directly into the larger 4in (10cm) pots. So while you may think your are giving your seedlings a treat with a big, roomy pot, my seedlings are perhaps proof that it pays to pot on your seedlings a few times before planting them out in the garden. Sure, you may need to spend out on more compost and more pots, but if you’re after healthy vigorous plants as early in the season as possible, it’s an investment worth making.